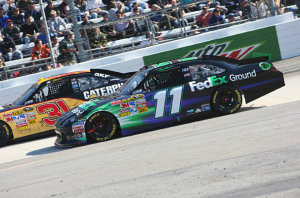 Denny Hamlin drove the #11 FedEx Ground Toyota to a fifth place finish in the TUMS Fast Relief 500 on the short-track of Martinsville Speedway. Hamlin led 58 of the 500 laps on the day, claiming first place on two separate occasions. With the result, Hamlin remains 11th in the Chase for the Sprint Cup championship with three races remaining in the season. With drafting essential to running well at Talladega, the FedEx team partnered with the #39 U.S. Army car of Ryan Newman in practice. But after Newman qualified 21 spots higher than Hamlin, the two were not able to connect early in the race. As a result, Hamlin was the odd-man-out with 43 cars on the track and struggled throughout most of the day to find a draft partner. Tony Stewart took the checkered flag to mark his third win of the season. Stewart was followed by fellow Chase contenders Jimmie Johnson, Jeff Gordon and Kevin Harvick. Hamlin’s Joe Gibbs Racing teammates Joey Logano and Kyle Busch finished 18th and 27th, respectively. A Virginia native, Hamlin has historically run well at Martinsville, which includes four career Sprint Cup wins on the half-mile oval. Driving the #18 for Kyle Busch Motorsports on Saturday, Hamlin earned his first NASCAR Camping World Truck Series win in his only truck start this season. The win puts Hamlin in elite company that is able to claim at least one win in all three of NASCAR’s top series. Sustaining minimal damage to the car, Hamlin was soon able to work his way back up the field. A caution flag on lap 27 brought most of the cars down pit lane. Seeing an opportunity to reclaim track position, Hamlin and Crew Chief Mike Ford made the decision to stay out on the track. By the third caution flag of the day on lap 46, Hamlin was running in fifth place. Under that caution, Hamlin and Ford once again decided to stay out and challenge for position. The strategy quickly paid off and Hamlin claimed the race lead by lap 63. A fourth yellow flag followed on lap 65 which brought the FedEx car to the pits for four tires, fuel and a slight track bar adjustment. With some cars on the lead lap deciding to stay out this time, Hamlin dropped to 14th place. Hamlin battled back to second place when a caution flag on lap 150 brought a welcome opportunity to pit for fresh tires and fuel. Back to green flag racing, the field settled in and was able to avoid a caution for 45 consecutive laps. On lap 196, the eight caution flag of the day brought the FedEx car to the pits for four tires, fuel and a wedge adjustment to the right rear tire. The green flag waved again on lap 203 with Hamlin in 3rd place. With the car freeing up on him, Hamlin kept fighting to stay toward the front of the pack. By lap 258, the FedEx team was running in second place when a caution flag slowed the field. On the ensuing pit stop, the crew made a second track bar adjustment to go along with fuel and four tires. Now on fresh tires and with improved handling, Hamlin was able to pass race leader Jeff Gordon on lap 320 to reclaim the lead. Hamlin led 42 laps before Gordon took back the lead by getting inside position on turn four. With Hamlin now in second and just over 100 laps remaining, the team started to focus on pit strategy. Down the stretch, the team declined to pit on four consecutive caution flags before finally being forced to on lap 457 in third place. Three more cautions within 46 laps of the checkered flag followed and prevented the FedEx team from building momentum and making a late push for the lead.